I've gotten creative with my "Companion" with regards to our Christmas exchanges. This isn't anything new but rather an accidental tradition where we set a limit on our gift exchange. I think as children and perhaps young adults, somewhere, the message and the purpose of Christmas got a little lost among the growing list of "WANTS". I was talking with a friend about gift budgets for 'companions' and told her my budget was $75CDN. That's enough, I think. But she gave me a blank stare and responded with a "what are you ever going to get with that much???" It's a good thing that in addition to my very expensive tastes, I have some less expensive tastes as well. I have a knack for geeky toys and games. Good thing for the gifter, huh? Meet my Robot Friend, Awesom-o. He comes with two shopping bags too! I took this photo of my subject on my laptop just to get started with my photo project this week. 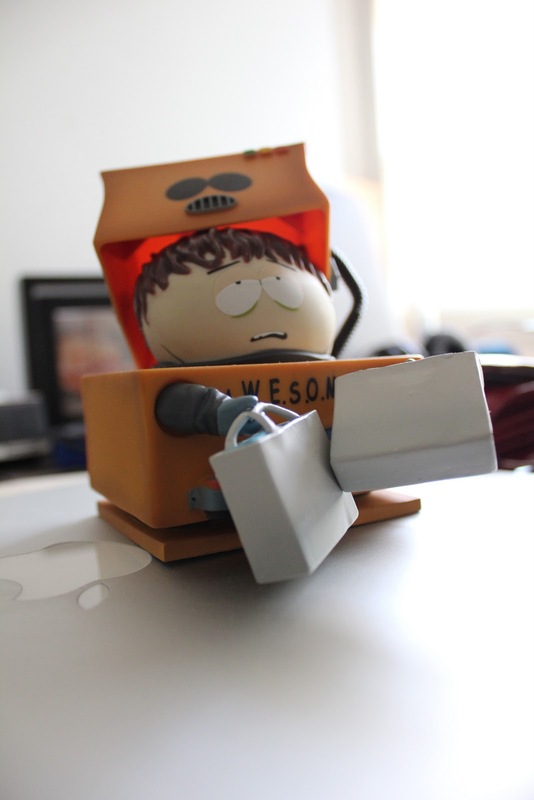 This is how cool Awesom-o is! Complete with the toothpaste eating disheveled Eric Cartman on the inside. Boy, he looks exhausted. I thought I'd mix it up a bit and place my subject in a jungle-like setting to mimic the trauma that could have potentially caused the expression on his face. My initial take was poorly lit because of the bright background. I decided to experiment with lighting. The first one came out too bright with my flash and washed out the original bright background. I attempted the desk lamp at a downward angle facing slightly away from the subject to reduce any unwanted shadows. This is clearly the incorrect type of lighting and I'll need to find something with less of a yellow tint. Maybe I'll consider using a reflective board to bounce the outside light off the front of my subject next time. You can definitely tell that there is artificial lighting is used here...but in this shot it works! CL: at first i thought it didn't look quite right but then it was pointed out to me that it looked like cartman was returning from a jungle only to be greeted with fire or something like that. i guess it's artistic.